As a Life-long Northside resident, Councilwoman Darlene Harris has served Council District 1 since special election in November 2006, but she has served the people of Pittsburgh for more than three decades as a true community advocate. Mrs. Harris began her dedication to community and union activism not through her education – she is trained as a dental assistant – but through her husband, John, who is a member of International Brotherhood of Electrical Workers (IBEW Local 5). Her devotion to public service has often centered on making neighborhoods better places to live. Mrs. Harris has worked with Spring Hill Civic League for more than 20 years, serving as President of the organization and then as a founding member of the North Side Leadership Conference. She helped create the North Side Public Safety Council and has served statewide on the Pennsylvania Commission on Crime and Delinquency. 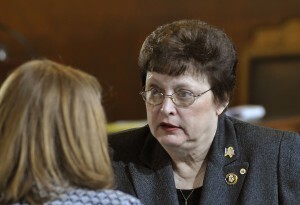 Mrs. Harris’ commitment to the community has earned her numerous awards, including the Commonwealth of Pennsylvania Governor’s Award in recognition of Citizen Volunteer Services, and has resulted in State Senator Costa inviting her to join the working group to restructure the workings of the PIAA. Mrs. Harris is also a leader in the Democratic Party. She worked for State Senator Len Bodack and has served as 26th Ward Democratic Chairwoman for over a decade. She has fought for quality education for Pittsburgh students and served as Board President of the Pittsburgh Public Schools, receiving several awards in that arena, also. Some of Mrs. Harris’ notable achievements on City Council include the creation of a Free Spay + Neuter Program for City residents, that has helped control our stray animal population, and her work on Council’s legislation that dedicated parking tax revenue towards the City’s pension fund, preventing a State takeover. She also co-sponsored ‘Billboard Tax’ legislation, which could help raise revenue from an industry that has not been paying their fair share. Mrs. Harris credits her ability to give so much to making Pittsburgh a better place to live to her faith and family. She is an involved member of St. Mathew’s Lutheran Church in historic East Allegheny and the proud mother of three and grandmother of four.